The first certified Passivhaus in Washington, D.C. An entry in the 2011 Solar Decathlon became Habitat for Humanity's foray into high-performance building and was the city's first certified Passivhaus project. Image Credit: Habitat for Humanity of Washington, D.C. High-performance houses might not seem the most logical choice for Habitat for Humanity, a non-profit that builds affordable housing on tight construction budgets and relies on non-professional labor. Renewable energy systems have high upfront costs, and the extra insulation, air-sealing and other detailing that make Passivhaus or net-zero energy construction possible take more time, building expertise and money than conventional houses. But Habitat affiliates around the country are beginning to build these high-performance designs and offering them to families that ordinarily would be priced out of the market. Projects are currently underway in many parts of the country, including Washington, D.C., Missouri, California, Minnesota, and Wisconsin. It’s a homegrown trend taking root without any directive from Habitat’s international headquarters in Atlanta; each Habitat affiliate is a separate entity that makes its own decisions about what kind of housing to build. Net-zero, Passivhaus and other high-performance designs are still a fraction of the total number of Habitat projects, accounting for roughly 1% of the 3,800 new housing units that Habitat built in the U.S. last year. 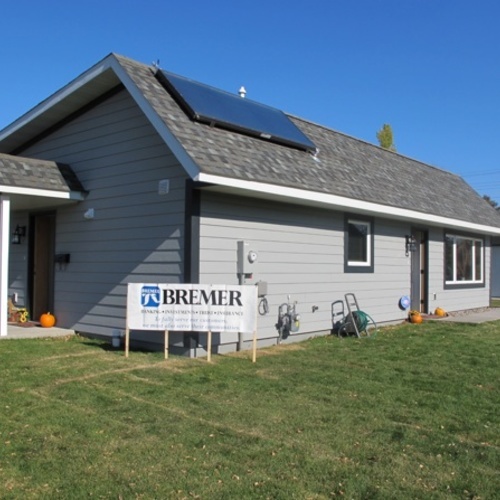 But for a variety of reasons, local Habitat affiliates are now more likely to try these cutting-edge designs, and over time that will mean much lower utility and maintenance bills for the homeowners lucky enough to get them. In some cases, the Passivhaus projects are the first to be built in the community by anyone. Here’s a rundown on several projects around the country. took advantage of the biannual U.S. Department of Energy’s Solar Decathlon to jump into high-performance housing. Until 2011, the design competition for college students, sponsored by the U.S. Department of Energy, had taken place on the National Mall in Washington. When it was over, these demonstration homes were dismantled and sometimes junked, says Heather Phibbs, Washington Habitat’s director of marketing and development. 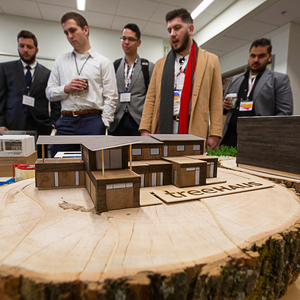 But in this case, the Parsons School for Design and the Stevens Institute of Technology approached Habitat and suggested a partnership to turn its Decathlon entry into housing for a Washington, D.C., family. When the Decathlon ended, the project, called the “Empowerhouse,” was taken apart, moved to a site in the Deanwood neighborhood in the northeast part of the district and turned into a duplex. The project was certified by the Passive House Institute U.S. and built to operate as a net-zero energy home. 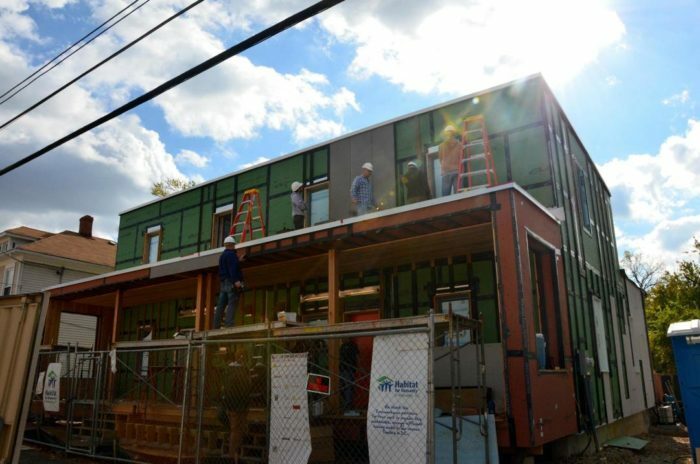 “It was the first time we had built a Passivhaus, Habitat for Humanity of DC, and it was the first Passivhaus ever built in DC,” Phibbs said. 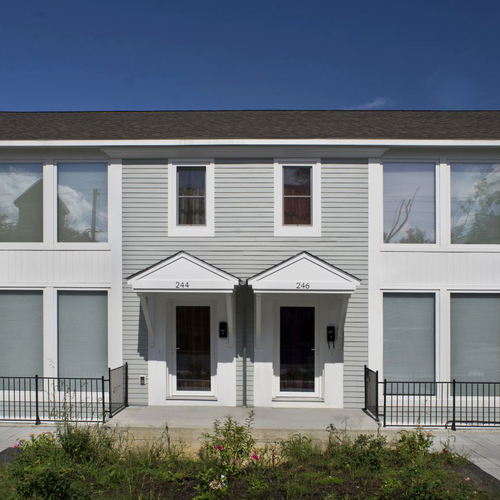 The Habitat affiliate has since launched six Passivhaus projects in Ivy City, a part of the city where it and two other nonprofits are building a total of 60 affordable housing units. Working with money from the Department of Housing and Urban Development and land grants from the city, the Habitat affiliate has been building a total of 30 housing units. Six of the 11 housing units in the last phase of this project are designed for Passivhaus certification. Conditioned space: 1,404 sq. ft.Number of floors: 2.Bedrooms: 3.Bathrooms: 1 1/2.Construction: 2×4 stud wall with 9 1/2-in. I-joist balloon framed wall on the outside.Type of foundation: Slab.Windows: Klearwall Future-Proof triple-glazed, argon-filled.Ventilation: Energy-recovery ventilator.Domestic hot water: AO Smith Cirrex solar electric.Heating and cooling: Single wall-mounted ductless minisplit.Insulation: Above the slab, 6 in. of XPS, followed by 3 1/2 in. of mineral wool, R-49. Above-grade exterior walls, Roxul mineral wool in 2×4 structural wall, dense-packed cellulose in balance of wall, R-45. Roof, 8 in. polyisocyanurate foam, R-49.6.Blower-door test: Not yet available.Cost of construction: $172/sq. ft. Conditioned space: 1,248 sq. ft.Number of floors: 1.Bedrooms: 3, plus large loft.Bathrooms: 2.Construction: 2×6 stud wall built with advanced framing techniques.Type of foundation: Slab.Windows: Triple-glazed Jeld-Wen.Ventilation: Energy-recovery ventilator.Domestic hot water: Solar thermal with electric backup.Renewable energy: 8 kW photovoltaic system.Heating and cooling: Ductless minisplit air-source heat pump.Insulation: Under slab, 4 in. of rigid foam. Exterior above-grade walls, a combination of open-cell foam and blown-in cellulose with 2 in. of rigid foam on exterior, R-30. Roof, 1 1/2 in. open-cell foam plus blown-in cellulose, R-60.Blower-door test: Not yet available.Cost of construction: $85/sq. ft. Conditioned space: 3,749 sq. ft. (total for three units)Number of floors: 3.Bedrooms: 8.Bathrooms: 3 full, 3 half.Construction: 2×6 exterior walls, built with advanced framing techniques.Type of foundation: Slab.Windows: Double-glazed Simonton.Ventilation: Heat-recovery ventilator.Domestic hot water and renewable energy: Combined Echo Solar System includes solar hot water and photovoltaics producing 4,000 kWh of electricity and 122 therms per year. Domestic hot water system also incorporates a tankless heater. Heating and cooling: Wall-mounted electric resistance heaters; no air conditioning.Insulation: None under slab. Most exterior walls have high-density fiberglass batts with 1 in. of rigid foam on the outside. Roof, 8.2 in. of open-cell foam under roof deck, R-30.Blower-door test: Not yet available.Cost: $110-$125/sq. ft. The 1,400-square-foot three-bedroom houses (see sidebar at right for more details) are more expensive to build than the kind of housing Habitat usually takes on — about $172 per square foot compared to a more typical $110 per square foot. The houses will sell for between $180,000 and $200,000, Phibbs says, with Habitat raising the money to fill in the gap between the sales price and actual construction costs. Separately, Habitat has been contemplating a crowd-sourcing campaign so the houses can be equipped with photovoltaic panels. Habitat tries to identify prospective homeowners before or during construction so the families will have the chance to work on their own houses. In Washington, each family must contribute a total of 300 hours of sweat equity to quality for ownership, although they can still qualify by working on someone else’s house. “It’s a little bit of a trick to build these things affordably for Habitat families,” Phibbs says. The new owners of these Passivhaus homes will have incomes of between $30,000 and $60,000 a year, representing 30% to 60% of the median income in the area, which is $100,000 a year. The lower operating costs for Passivhaus homes is a great match with families living on tight budgets. But it can be challenging to apply the Habitat model to houses that require a lot of construction acumen to build. 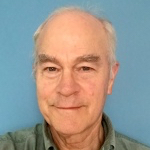 All Washington Habitat projects involve some professional labor, and in the case of Passivhaus designs, Phibbs says, there’s just a little more of it. entered the world of high-performance building at the invitation of the city of Columbia, according to Bill View, its executive director. The city circulated a request for proposals among Columbia’s housing development agencies asking for their most energy-efficient designs and offering $66,000 in seed money to the winner, View says. Among the few requirements were the use of either a ground-source heat pump or a ductless minisplit heat pump for heating and cooling, and a generous amount of insulation. Three other organizations offered bids, but the Habitat affiliate took home the prize. It’s the first Habitat project of its kind in Columbus. That $66,000 is almost enough money to build another home for another family. The house (see the details at right) is under construction and may be finished by late spring or early summer, depending on weather and other factors. The Habitat chapter has five or six other projects underway at the same time. Designers originally considered a ground-source heat pump, View says, but the project’s engineer suggested that using an air-source heat pump instead would free up $10,000 that could be spent on photovoltaic panels. Eventually, he adds, designers settled on an 8-kW system that on paper would make net-zero operation possible. View expects the 1,248-square-foot three-bedroom house to sell for $107,000, exactly what Habitat will have in it. It’s likely to go to a buyer with an income of as much as 80% of the median income in the area. Habitat houses there are typically sold to those making 30% to 50% of the median. Santa Barbara, California, is a wealthy community on the coast a few hours north of Los Angeles, and its is one of several in the state building high-performance housing. It’s difficult to find lots for single-family Habitat housing in Santa Barbara, says Alexandra Hamill, the affiliate’s development manager, so they’re concentrating on townhouses. 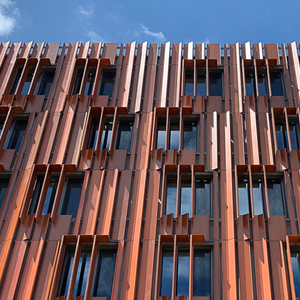 Their current project incorporates three buildings, one of which is a three-unit building which Habitat hopes will to have certified as a Passivhaus. It includes two three-bedroom units and one two-bedroom unit with a total of 3,749 square feet of conditioned space (see the details at right). The other two buildings will be built to the same standards, but Habitat won’t seek Passivhaus certification for them. Habitat’s last project had been constructed to meet requirements of , a local sustainable building program, says Jon Peterson, the affiliate’s associated executive director. As they began design work on the townhouse project, architects from DMHA, a local firm, were aiming for Level 4 compliance with Built Green, which would have been a step up from Level 3 of the previous project. They also considered seeking certification under the LEED for Homes program administered by the U.S. Lakesideca Council. But in the end, LEED didn’t seem to offer what the affiliate wanted. One of the architects working on the Canon Perdido project had a background in Passivhaus design, as did the construction manager, Peterson says, and that helped tip the scales. The building was relatively simple in shape, without any complex roof geometry, and it looked like a good bet for Passivhaus construction. 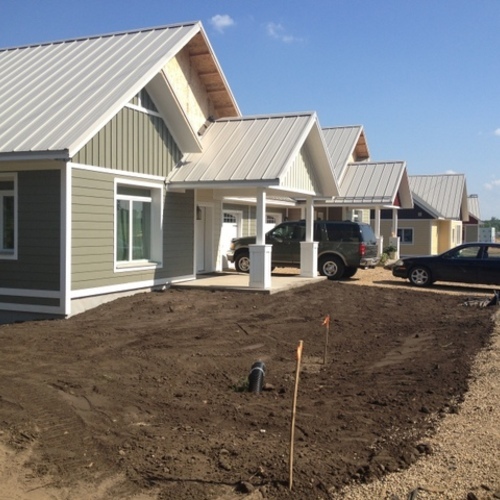 Habitat broke ground on the project in June 2013 and hopes to have it wrapped up by this summer. It will be the affiliate’s first Passivhaus building. Families that move into the townhouse will have incomes of between 40% and 80% of the area’s median income, or $30,000 to $60,000 a year, Hamill says. There were 100 applicants for the dozen housing units in the project. Although Habitat officials were thrilled to be working on a Passivhaus project, they didn’t advertise that aspect of the project to the public, and neither Hamill nor Peterson thinks the benefits of living in a Passivhaus were obvious to people who applied to live there, or even the people who worked on the buildings. That said, Peterson adds, a local American Institute of Architects tour of the project was the most well-attended in some time. 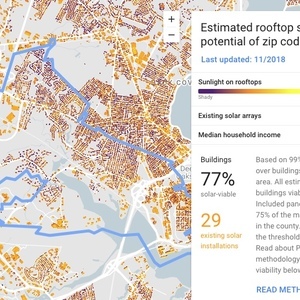 High-performance buildings are intriguing to builders looking for new challenges, but they represent a very small fraction of the houses that Habitat builds, and very few affiliates around the country are tackling them — only 15 of the nation’s 1,500 total, according to Derek Morris, director of construction technologies for . Roughly three-quarters of new Habitat houses are built to Energy Star standards, but going the extra mile for Passivhaus or net-zero performance isn’t always the best use of limited resources, Morris says. 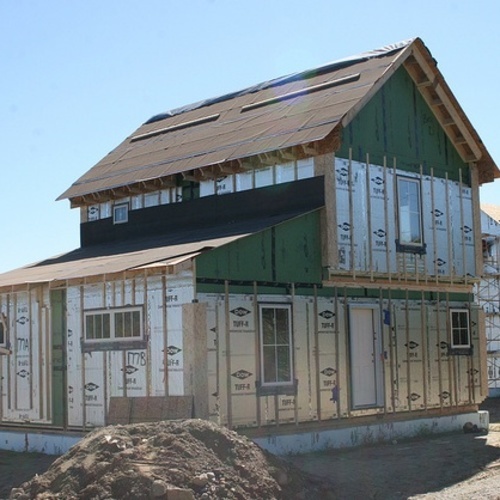 Affiliates that do make the leap have started by learning the basics of energy-efficient designs, embracing advanced framing techniques and air-sealing, for example, or learning how to orient houses correctly on the site. Once they’ve mastered those things, he adds, net-zero or Passivhaus construction is a more attainable goal. But all decisions are local, he says, as affiliates focus on Habitat’s “number-one objective,” the elimination of poverty housing. “Part of the challenge is always the allocation of resources,” he says. “As you’re doing Passivhaus or net-zero, you end up having a greater upfront investment in it. If you have the ability to do one home, that’s great, but what do you do about the other homes that are needed in the area? I think you might want to recheck your information on Habitat and what makes a house "High Performance" - an edict did come down a few years ago for building more energy efficient "green" homes which a lot of the affiliates are doing. One of the big reasons for this is they realize that there is more than just a mortgage to consider when it comes to putting need families into a home. Granted building a "PassivHaus" (which should be considered a Passive House in the US) is more costly, but many of the affiliates are building houses in the HERS 40-60 range for basically the same price as they were building "normal" (the only thing missing to take them to net-zero is solar) - granted some of this has to do with grants & deductions but that has always been the case. 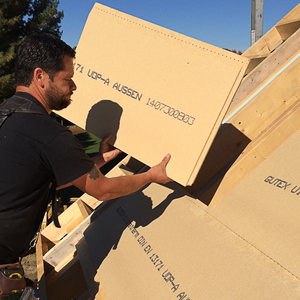 Check out Huber Zip R-sheathing. Use it along with sealing the rest of the framing for a low ACH build that includes a layer of continuous insulation and has the OSB sheathing well protected from moisture damage. Proper window and door flashing is mandatory. Build with Zip R-sheathing homes that are meant to last decades and that may be fitted with enough PV to be Net Zero. Zip R-sheathing is trades friendly, storm worthy, and budget worthy compared to rebuilding a home built with standard OSB that is half rotted in less than a decade of water intrusion issues due to minor goof ups in design and or installation or unforeseen 100 year storm events... etc. Try it, you might like it. I do not have an interest in the Huber company. My interest lies in the fact that most homes built are using standard super low cost OSB with some switching to Zip but few switching to Zip R-sheathing. OSB must remain moisture free to be worth using which is quite the risk and roll of the dice. Zip is a good product on one side. But the inner backside to me needs a moisture barrier now that we are building tight homes with elevated moisture concerns in assemblies. Zip R-sheathing has that barrier. The other way to improve Zip is to shoot the backside with a 1"-2" layer of closed cell foam... My feeling is the Zip R-sheathing is preferable as there is no risk of shooting any spray foam that is off gassing from a bad mix or whatever. So Try Zip R-sheathing. And those that like to do research, lets get some research going as to Zip R-sheathing being a good long term choice in place of OSB and all the rot horror stories. Google; OSB rot, then select images.... even more fun first go to theslideshow.net, then search OSB rot. Calm down a bit. Neither you or Huber know how Zip R-sheathing performs over the long run. Does HH revisit the homeowners to inquire how the homes are performing?